Chun-hyok Kang is sitting by the window of a third-floor boutique hotel room on 32nd Street in Manhattan. As he looks out at the tall skyscrapers engulfing the bustling city streets, he comments how they seem to block out the sun and keep the mornings in the city chillier than he’s used to. Dressed in a black fitted baseball cap, slim-cut jeans, and a dark sweater emblazoned with a colorful logo that he’s layered over an Adidas basketball jersey, Kang is here to launch his debut hip-hop song and video, “For The Freedom.” The song is hooked around an eerie and melancholic piano loop fused with a brooding, dramatic beat. As he talks about the symbolism of the Air Jordan sneakers that open the video, the influence of 2Pac on his own music, and the tattoo on his left arm that bears the song’s title, he comes across like any number of aspiring out-of-town rappers who’ve taken a promotional pit stop in New York City to spark their hip-hop career into life. But Kang’s story is different. He’s a defector from North Korea. Today there will be no glamorized origin tale about days spent hustling drugs in the trap. Neither will there be any anecdotes about catching an industry break by accosting a celebrity rapper outside a radio station and dropping a freestyle. Instead, Kang recounts his upbringing in a totalitarian country where claims of human rights abuses and torture are a part of daily life as the country’s leader, Kim Jong-un, pushes to develop nuclear weapons. Relaying his message through a translator who’s sitting across from him in the hotel suite, and alongside Joanna Hosaniak, the deputy director general of the Citizens’ Alliance for North Korean Human Rights organization which helped facilitate his visit, Kang spends much of the interview explaining how his music is a vehicle for telling his life story. This isn’t an easy feat to pull off. Even in the Internet age, North Korea is a blocked territory that uses the Kwangmyong system — a closed intranet that should (hypothetically) mean that the leadership can control what information is and is not available to its citizens. For Kang’s music, this means his best hope of getting his message heard back home comes from the small but growing number of people who, he says, “smuggle USB drives and CDs in because they do that these days.” (Hosaniak adds that one increasingly popular tactic is to try and shoehorn banned footage into the commercial breaks between Korean soap operas.) In this case, both the message and the medium of “For The Freedom” are contraband hip-hop. 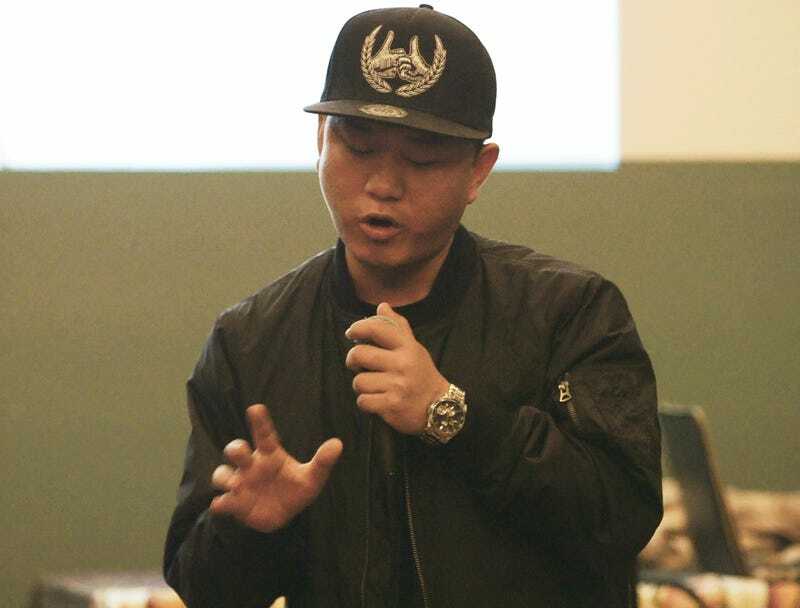 Chun-hyok Kang might be setting his stall out to become North Korea’s first defector rapper, but he’s not alone is seeking to flee from his country of birth. He estimates there are currently around 30,000 other North Koreans who have taken up refuge and new lives in South Korea, usually traveling via China. The moves are in large part sparked by a famine that hit North Korea during the mid-‘90s as a result of natural causes (floods and droughts) and political mismanagement by a centralized government. Kang hails from Osung-kun in the North Hamkyung province of North Korea. As he tells his story of defection, he frequently talks about times of great malnutrition in his home region. In an essay titled “The Testimony of Chun-hyok Kang” that he wrote to accompany his visit to New York City, he recalls a fourth-grade friend, Lee Kwang Jin, whose family were cut off from food rations and became so emaciated “that it was painful to even look at them.” Eventually, Jin was found frozen to death by the riverside. Elsewhere, he writes about witnessing people attempting to survive by “making soup from tree bark,” remembers school friends who developed sores on their faces after trying to eat grass, and recalls days when he himself subsisted on gruel. Faced with a life shackled by these “invisible chains” of the state, in 1997 Kang’s father decided to decamp to China to pick up work for a couple of months. The move resulted in his remaining family being monitored — and often harassed — by the North Korean Security Safety Agency. When Kang’s father was caught traveling home via the Tumen River by the National Border Patrol and in possession of 250 yuan (around $35), he was taken to a labor detention center where he contracted a bacterial infection due to the demands of 17 hour hard labor shifts fueled by little more than ground maize and salt water garnished with only a few radish leaves. Luck might have been on Kang’s side, but his ordeal wasn’t over yet. While hiding in various homes in China, he and his family were locked up for a month. He was 16-years-old at the time. After a month locked up, Kang and his family were taken from their cells and walked to a car. “I just gave up — I thought I’d be killed when I got back to North Korea,” he says. But unbeknownst to Kang and his family, his cousin who’d escaped earlier had managed to bribe the local police and secure their release. “I was scared and I just kept looking back until I couldn’t see the police,” Kang recalls as he exited the vehicle and finally completed his nervy walk to freedom. When Kang eventually settled in South Korea, he found an environment where his artistic instincts could prosper. Back in North Korea, he says the only music he heard was a series of political marching songs designed to pay homage to the country’s leader. “At the time I didn’t have any special feelings about the songs,” he says, although he’d quickly explore new avenues of creativity. It’s not surprising that when asked to namecheck American hip-hop artists who have influenced him, Kang focusses on 2Pac. (He’s also a fan of J Cole, Nas and The Notorious BIG and avidly watches documentaries about them.) “I know that 2Pac had a difficult relationship with BIG and they had this very serious conflict,” he says, “but in terms of expressing his music, I think that I really love the part where 2Pac just tells his story regardless of what people were talking about it. Kang admits he’s not one of hip-hop’s great technicians — “People do tell me I am getting more comfortable when I’m rapping,” he says — and in that sense he shares 2Pac’s belief in conveying a message with urgency, passion, and emotion rather than focussing on lyrical dexterity as its own end. The “For The Freedom” video underscores this tactic: One of its most poignant scenes occurs when Kang displays a tattoo on his arm that shows the song title with the following series of numbers underneath, 19980309. The numbers are a reminder of the day he finally crossed the Tumen River. It’s his own version of ‘Pac’s infamous “Thug Life” tattoo, a signifier of his story and his reason for rapping.